Practice Change: These new intraarterial interventions WORK on patients with large ACA and MCA strokes seen on imaging. The NNT to provide a patient with functional independence is 8. The window of intervention is increased up to 12 hours after last seen normal. The procedure details aren’t important, but knowing that these interventions exist and discussing them with your neurologist IS important. Background: IA tPA and also clot retrieval devices have had a decade of questionable results, this changed in Jan 2015 with the Mr CLEAN trial in the NEJM (yes, that really was the name). There were 3 other trials ongoing at the same time, which were all stopped early and also showed positive results. Population: 500 Dutch patients with a proximal clot in the Anterior or Middle Cerebral Artery seen on MRA or CTA who could have treatment completed within 6 hours. All patients were given IV tPA, then if not improving, they were THEN randomized. Able to carry out all usual activities, despite some symptoms. Able to look after own affairs without assistance, but unable to carry out all previous activities. Requires some help, but able to walk unassisted. Unable to attend to own bodily needs without assistance, and unable to walk unassisted. Secondary outcomes: NIHSS at 24 hrs and 7 days. Time to randomization was 200 minutes, and time to groin stick was about 260 min. 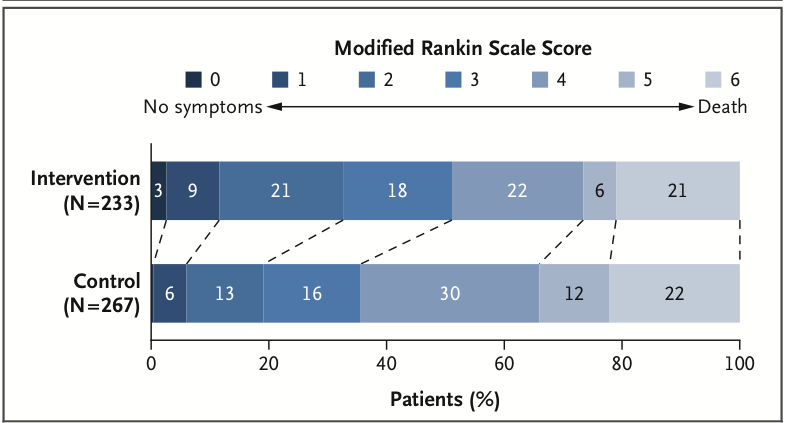 Modified Rankin Score of 0-2 (Independence) at 90 days for treatment was 32.6% vs 19.1%. NNT of 8 to move one person to functional independence from dependence. Subsequently 3 other trials with similar inclusion criterion were stopped for early analysis, and ALL THREE were positive and published in NEJM — ESCAPE and EXTEND-IA were published Feb 11, 2015, SWIFT PRIME on April 17, 2015. The main results are in this table, followed by more details if you want them. CONCLUSIONS: These studies look very promising and if the NNT really is 8 patients to give someone functional independence, that is AMAZING. We should be trying to implement these strategies as possible. This had enrollment up to 12 hours later. This entry was posted in *PRACTICE CHANGING, Neurology and tagged Stroke. Bookmark the permalink.